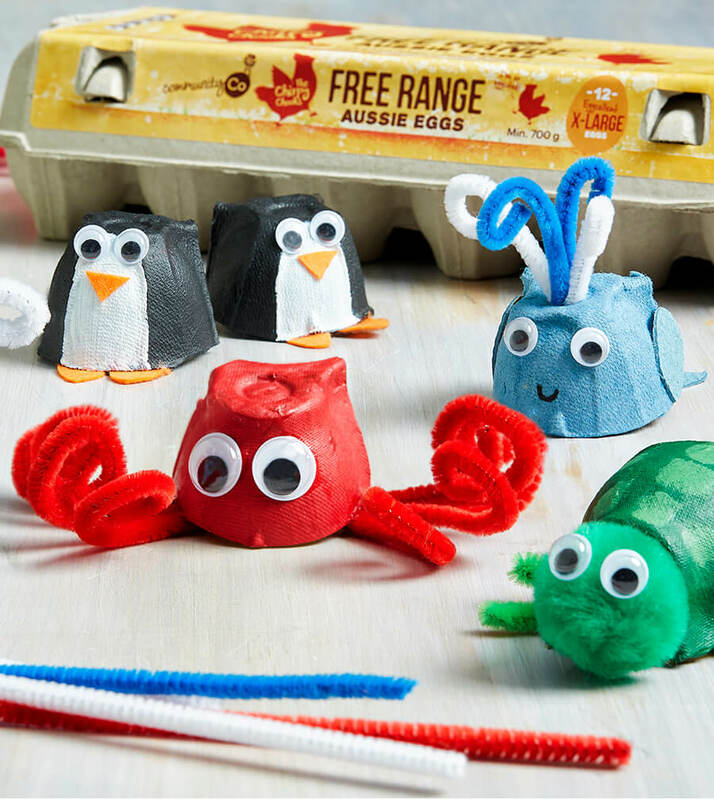 Get creative with your leftover egg cartons! Cut out an eggcup, and then cut it in half. Paint it green and let it dry. Draw little squares with a lighter green paint. Meanwhile, cut a dark green pipe cleaner into 4 equal sized pieces for the legs. Glue a green, medium-sized pompom onto the flat side of the eggcup. Glue on 2 medium size googley eyes. Glue the legs onto the long, straight edges of the eggcup. Let it dry over night. Cut out an eggcup and paint it red. Cut out 8 long, even pieces of red pipe cleaner and form a curl at one end. When the paint is dry, glue 2 large googley eyes to the front of the egg up, and glue 4 of the pipe cleaners onto each side to make the legs. Let it dry overnight. Cut out an eggcup, and paint it black, except a strip in the middle. Paint that white. In orange felt, cut out a triangle shape for the beak, and 2 oval shapes for the feet. When the paint is dry, glue on two small googley eyes and the beak, then the feet. Set aside to dry overnight. Cut out one of the egg cups and 2 teardrop shapes and a tail shape out of the lid of the egg carton. First, glue one tear-drop shape to each side of the egg cup, then the googley eyes. As mum or dad to make a cut at the top of the egg cup. Cut a blue and a white pipe cleaner in half. Bend each pipe cleaner in half again, and create a curl at the tops. Insert both pipe cleaners into the cut you made at the top of the egg cup. Now glue the tail onto the bottom. Set aside overnight to dry overnight.